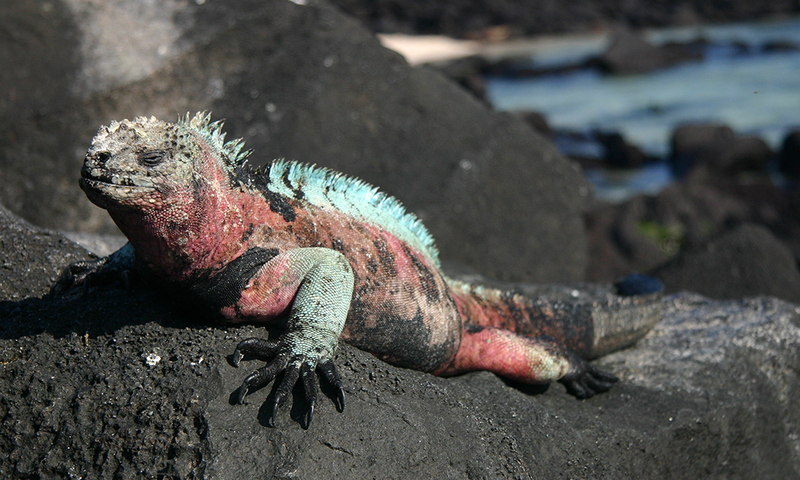 Marine iguanas are endemic to the Galapagos Islands and are the only sea-going lizards in the world! The marine iguana is the only lizard in the world with the ability to live and forage at sea and is endemic to the Galapagos Archipelago. There are six very similar subspecies, each from different islands, with those from Isabela and Fernandina being the largest. The adults are black for most of the year, however the males change colour during the mating season – with different subspecies adopting different colourations. Near Española and Floreana they are most colourful – turning bright green and red; on Santa Cruz they are red and black; and on Fernandina they become dull green and brick red. The juveniles are generally black, with a lighter dorsal stripe than the adults. During the mating season males fight for dominance over harems of females, which they will fiercely defend from rival males. Marine iguanas are not a very agile species on land, but they are excellent swimmers – moving easily through the water as they feed on algae. Larger individuals go further out to sea and use their powerful claws to grip on to rocks in strong currents to feed, whilst the smaller ones stay inshore near rock pools, feeding on algae exposed at low tide. 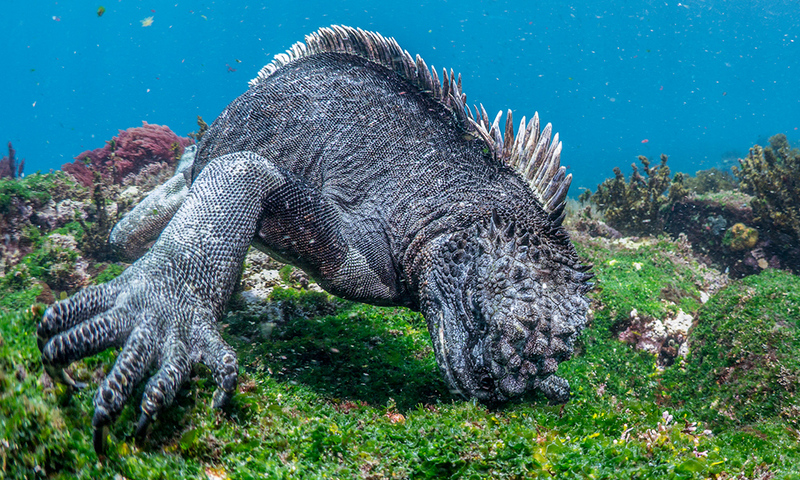 Due to the high concentration of salt in their diet, marine iguanas filter their blood at the nose and sneeze out the excess salt, often forming salt crystals on the snout. Despite not being truly social, iguanas are highly gregarious – especially on cold nights when they tend to group together to conserve heat. In the morning, they bask in the sun, absorbing heat with their black scales until they have enough energy to swim out to sea to forage. Upon entering the water, their heartbeat slows to half its normal pace in order to conserve energy and allow them to feed for as long as possible. Where to see them: They can be seen in coastal regions on the islands of Isabela, Fernandina, Española, Floreana, Santa Cruz and other islets around them. When to see them: They live on the islands all year round, with the mating season occurring between January and March. They are active during the day and spend a lot of time on rocks basking in the sun. Threats: The introduction of cats and dogs by humans has greatly affected the numbers of marine iguanas as they predate upon the juveniles, which are poorly adapted to defending themselves against large land predators. El Niño periodically decreases the iguana population (by up to 85%), as it cuts short their food supplies. Oil spills may also have similarly dramatic effects on the population. They could also be threatened by marine plastic pollution – specifically microplastics. 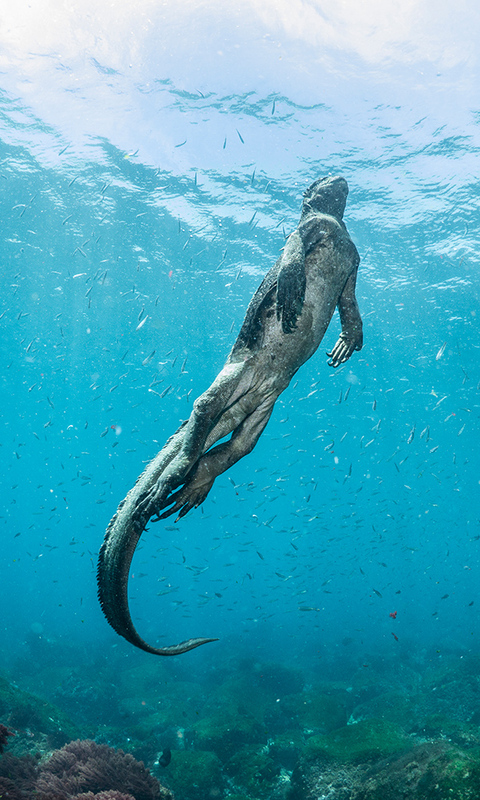 Conservation: The marine iguana is protected under Ecuadorian law and is listed under CITES Appendix II. Currently, we are working with partners to assess the risk of marine plastic pollution to marine iguanas as part of our Plastic Pollution Free Galapagos programme. GCT has funded a research project investigating the population dynamics of the marine iguanas on San Cristobal as there may in fact be more than one species of marine iguana present on the island. Please help us protect marine iguanas by donating today! A fabulous short video kindly donated to us by videographer Dustin Adamson.